Two approaches exist in TAdvStringGrid to set cell drawing properties. Setting cell color, font colors and style, alignments can be done with the events OnGetCellColor and OnGetAlignment. This approach provides an effective method for setting the cell characteristics as there is no memory overhead required per cell to store the cell properties. An additional advantage of using the OnGetCellColor and OnGetAlignment events is that the properties can be set dynamically depending on the content of the cell. A typical example is setting font colors black for positive numbers and red for negative numbers. Writing a single OnGetCellColor event takes care of this and no additional memory is required to store the color values. Grid.Colors[col,row]: TColor : sets the background color of the cell, when color is clNone, default color is used. Grid.FontColors[col,row]: TColor : sets the font color of the cell, when color is clNone, default color is used. Grid.FontSizes[col,row]: Integer : sets the font size of the cell, when font size is 0, default font size is used. Grid.FontStyles[col,row]: TFontStyle : sets the font style of the cell, when font style is , default font style is used. 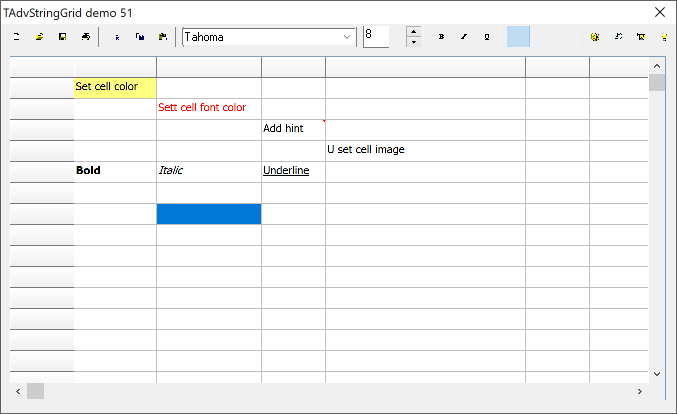 Grid.FontNames[col,row]: string : sets the font name of the cell, when the string is empty, the default font is used. Grid.Alignments[col,row]: TAlignment : sets the horizontal alignment in the cell.